I look forward to interacting with you all in my journey that I hope (and assume) will end in Orthodoxy. In this respect, and all others, I appreciate your prayers! Are you ethnically Japanese, or an immigrant worker living there? I'm American but have lived in Japan now for a little over 3 years. Awesome! Thanks for sharing, and welcome to the forum! I have been told that for a Japanese person to convert to Christianity, it is looked down upon in Japanese culture. Is this true? I understand that to be true as well. The boss I had last year at the university I work at is a Japanologist, and he says that the Japanese tend to look down on anyone who takes religion very seriously or passionately. They are seen as fanatics. Almost all Japanese prefer a fashionable Western style "Christian" wedding (like in the movies), but they will prefer to have a Shinto ceremony performed for their infants, and the Buddhist priests handle funerals. They tend to not rigidly define "religions" into categories as we do in the West, at least that is my understanding. Christianity has never had a strong presence in Japan, no matter the movement: Roman Catholic, 'indigenous Protestant' attempts, or otherwise. I think it just depends on who is around you. On the one hand, the Japanese traditionally respect authority and so clergymen are respected, for the most part, regardless of the religion. But Japan is a pretty a-religious society. Shrines and temples are prevalent but religion is pretty absent from the every day lives of the people. Perhaps in part because of this, there isn't much of a distinction (so I've been told by my Japanese girlfriend) in the minds of most Japanese between "cult" and "religion." And so any fervent religious observance is viewed with a certain amount of suspicion, this is might be due to the fact that Japanese society is fairly "group-based" and, since the society at large is not religiously observant, to become so is to in some way remove yourself from the group. At the same time, I've heard a few Japanese people comment that Japan is suffering from it's lack of religiousness. The Japanese people I'm closest to- my girlfriend's family- don't seem to care one way or the other if she were to convert. This is more or less my experience. I've heard it said the Japanese are "born Shinto, marry Christian and die Buddhist." There is also somewhat of a industry of white men who perform the role of priest for Japanese weddings. The ceremony is an entirely civil ceremony I would assume, occuring in a "chapel," but the priest is there just to add to the "ambience" since he is not ordained and usually has a completely unrelated day job. Interestingly though, I've heard that at one point Orthodoxy was the predominate form of Christianity in Japan. Thanks for your response. The reason I asked is because a Japanese poster on another forum had said that he found it highly insulting for Christians to try to evangelize in Japan, and that Japanese who converted and left the way of the Shinto weren't truly Japanese, and shouldn't be trusted. How reliable his statements were, I don't know, but thought I would ask. I'm sure there are probably some people like that but I don't think they're the majority. Some Japanese can be pretty ethno-centric and nationalistic, but I think most educated Japanese- especially young people- know better. Like any country probably though, you can find these sentiments get more common in older populations, rural areas, people with less interaction with the west, less education, etc. The reason I asked is because a Japanese poster on another forum had said that he found it highly insulting for Christians to try to evangelize in Japan, and that Japanese who converted and left the way of the Shinto weren't truly Japanese, and shouldn't be trusted. This is exactly the attitude you will find with many Russian nationalists concerning those who convert to Roman Catholicism, which is at least a Christian religion. To be Russian is to be Orthodox. To be a good Japanese nationalist, one should pay a visit to the local Shinto shrine occasionally and help to pacify the spirits of the dead soldiers, and to petition the kami (gods). Also, 'Shinto' as a category divorced from Buddhism is a recent development in Japan, so in a sense categorical 'Shinto' religion is rather new on the scene, but most of the practices are in fact the ancient indigenous religion of the people. Based on my studies of Christianity in Japan, I would say that this is absolutely false. Orthodoxy has virtually no presence in Japan in comparison with everything else going on there. The only figure I have seen is that there are about 9,000 Orthodox Christians in Japan. Now Orthodoxy is definitely in the minority. In the article on the Japanese Orthodox Church wikipedia reports an estimation of only 25,000 Orthodox in Japan. However, on the article on Christianity in Japan, it says only 9000. My girlfriend read somewhere that at one point in Japanese history, I believe through the work of St. Nicolai of Japan, that Orthodoxy was the predominate form of Christianity. I'll have to ask her where she read that see if she can find the link but I'm sure it will be in Japanese. She could, however, have been mistaken. She could be correct. There was a very strong presence of the Orthodox. William Smith Clark was invited by the government to combat it. From what I've heard, Japan has become an extremely materialistic society. I've also read that many of the traditionally Christian religious symbols, such as blood (communion) and the Lamb are viewed as either repulsive, ridiculous, or humiliating. I was told that some Protestant churches in Japan rarely celebrate communion, because the concept of blood, even if only symbolic, is totally repulsive to a Japanese person. Therefore I wonder how it is approached in an Orthodox Church. Would receiving communion be a problem/offensive? Keep in mind that to a 1st century Jew (and indeed any observant Jew today) the idea of communion was (and is) incredibly repulsive. The thought of drinking blood was probably more problematic than the persecution of fellow Jews and the Romans. And yet, they still came. I was told that some Protestant churches in Japan rarely celebrate communion, because the concept of blood, even if only symbolic, is totally repulsive to a Japanese person. Therefore I wonder how it is approached in an Orthodox Church. Would receiving communion be a problem/offensive? We should not forget that Nihon has a strong vajrayana tradition since 平安朝,why nipongin have no problem with the tantratic blood-drinking rite and gods/godesses? I still haven't figured out, Elpidophoros, why your posts are such linguistic lessons. Growing up in Protestantism in the United States, it's my experience that many Protestants don't celebrate communion that frequently regardless of country. As for here in Japan, I've never encountered anyone who was repulsed by communion, etc. Before becoming interested in Orthodoxy I attended a Lutheran church here in which communion was served every month and no one seemed bothered by it. At the Orthodox church here, in which it's taught that the bread and wine are the Body and Blood of Christ, the Eucharist is served at every service- with no negative reactions from anyone. How a non-christian Japanese person that you were to meet on the street were to react, I don't know. I've actually never even thought about it before, but I'd be interested to know. I just wouldn't really know how to breech the subject. this is the first I've ever heard of this. I am studying Japanese right now in school and I absolutely love the language and culture. God willing, I'd like to study abroad for a semester in Japan. I've even looked up the Japanese liturgical texts and different things like that. 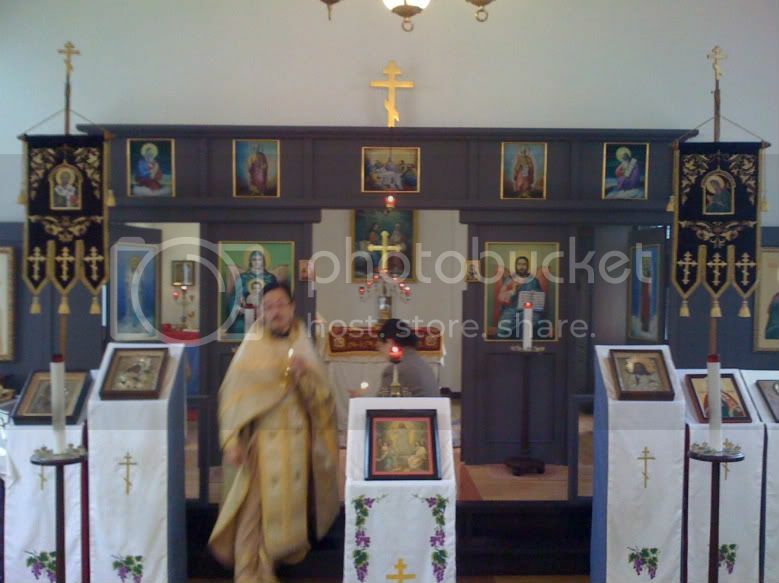 Does anyone have a recording of the Divine Liturgy in Japanese? If so, I would love to hear it. Gregory, in which part of Japan are you? My professor is from Kyoto. In regard to the notion posted in an earlier quote that "at one time Orthodoxy was the predominate form of Christianity in Japan", that is not my understanding. I believe most Christians in Japan were Catholic, owing to the activities of Portuguese missionaries in Japan dating from the 1500s. The city with the largest Catholic presence was Nagasaki. "Nagasaki is the seat of a Roman Catholic Archdiocese led by Archbishop Joseph Mitsuaki Takami." "Adam and Eve rebelled against the God and so escaped their ignorance in Eden and became fully human." Heavenly King, Comforter, Spirit of Truth help us to walk the way of Life, which is Christ Jesus. 주 예수 그리스도 하느님의 아들이시여 저 이 죄인을 불쌍히 여기소서. Welcome to the forum. At the high school where I teach, one of our English teachers taught in Japan for five years. He has had nothing but good things to say about it. That's great that you have Liturgy in the vernacular. non-orthodox Japanese: Do you orthodox guys celebrate new year every week? orthodox Japanese: No!! !We do not！！！What made you think so? non-orthodox Japanese: You have かがみもち in your church every sunday don't you? Kagami mochi (鏡餅):literally mirror rice cake, is a traditional Japanese New Year decoration. There was an EO presence on Hokkaido due to Russians there. There was not supposed to be any attempt to convert any Japanese. However St. Nicholas of Japan wanted to learn the language and succeeded in doing so as well as gaining a small number of converts. As I recall (though I will consult my books if you like) there was some resentment of this, but he managed to avoid being killed. He eventually went to Tokyo. If you are interested I can give some more information and a book title or two on the subject of Christianity in Japan. The first conversions were in the mid 16th century via the Portuguese and for some time there were thousands and thousands of Christians. This continued for some decades with sometimes support and sometimes banning (such as by Toyatomi Hideyoshi) until it was finally outlawed by Tokugawa Ieyasu in 1614. I have never come across anything like this at all. May I ask what your source is for this assertion? Shinto is not an offshoot of Buddhism and in Shinto contact with blood would make an person or object impure. And, I'm sorry, but I find your supposed "dialogue" regarding the New Year's rice cakes and prosphora bread to be quite peculiar. Are you saying that such an exchange actually took place that you know of or is it supposition? Some can be quite good and some of the anime is wonderful. I will admit that I am a fan of Miyazaki and Studio Ghibli. I would go so far to say that there is a hidden wisdom in such comic books.. In some of them at least. Have you read Fruits Basket and Yakitate Japan? Learned a lot of life's lesson from the former, and cooking and baking from the latter.. I haven't seen Yakitate Japan yet. I'll keep an eye out. I do have one that has an eccentric chef that is meant to teach English/Japanese terms. Your welcome!.. Who would have thought that Wasabe would taste good in bread? Lol. Yakitate has a lot of weird stuff in it.. But they said its based in real life. Don't know how true though. Very interesting... Do you know whether the Ecumenical Patriarchate recognize the Church of Japan? I've read that once the Ecumenical Patriarchate claimed jurisdiction over Japan through its Metropolis of New Zealand and later through the Metropolis of Korea. I'm not sure what you mean by recognize. I'm new to Orthodoxy, but I've never heard of His All Holiness claiming any jurisdiction in Japan. We're under the omophorion of the Russian Orthodox Church. Edit: I just looked at wikipedia and it says our autonomy is not universally recognized. Perhaps that's what you're talking about? I've never heard of His All Holiness claiming any jurisdiction in Japan. The title of metropolitan of Korea is : Μητροπολίτης Κορέας, ὑπέρτιμος καί Ἐξαρχος Ἰαπωνίας (Metropolitan of Korea and exarch of Japan).